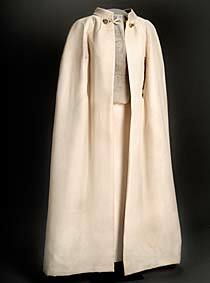 Jacqueline Kennedy wore this gown with matching cape, made of silk chiffon and peau d’ange, to her husband John F. Kennedy’s presidential inaugural balls. The first lady worked with Ethel Frankau of Bergdorf Goodman to design the dress. A fashion trendsetter and cultural icon, “Jackie” brought a sense of youthful glamour and sophistication to life in the White House. After President Kennedy’s assassination in 1963, the dignity and courage she displayed in mourning for her husband set a calming example for a bereaved nation. 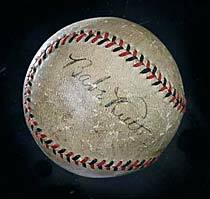 The New York Yankees’ legendary Sultan of Swat signed this baseball for a fan during a visit to Scranton, Pennsylvania. A neglected and delinquent child, Ruth discovered his love for baseball while living at St. Mary’s Industrial School for Boys in Baltimore. He began his major-league career as a star pitcher, but was reassigned to the outfield due to his powerful swing. With his record-setting home runs—60 in one season, 714 career total—and larger-than-life personality, Ruth thrilled fans and redefined the character of America’s national pastime. 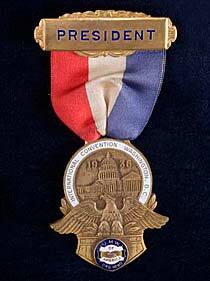 John Lewis, one of America’s foremost labor leaders, wore this badge at the 1936 United Mine Workers of America (UMWA) convention. Born in an Iowa coal-mining camp, Lewis went to work in the mines at age fifteen. He rose quickly as a labor leader, becoming president of the UMWA in 1920, and later helped found the Congress of Industrial Organizations. Lewis led a successful struggle to organize industrial workers, improving wages, safety, and benefits. 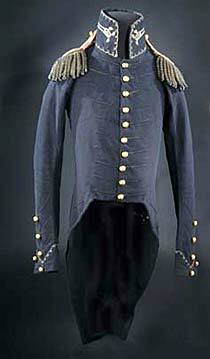 Indian fighter and military leader Andrew Jackson wore this uniform jacket during his famous victory at the Battle of New Orleans on January 8, 1815. Born to a poor family in the backwoods of the Carolinas, Jackson was elected president in 1828 as a representative of the “common man.” He fought against privileged wealth and helped develop the mass political-party system of today. A controversial figure, Jackson’s abrasive and confrontational style defined his personal, military, and political life. 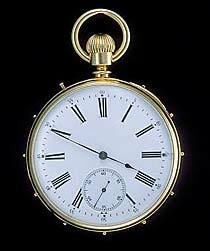 Specially designed with pins around the case edge to mark the hours, this Swiss-made “touch watch” was one of Helen Keller’s prized possessions. As a baby, Keller contracted an illness that left her completely deaf and blind. After years of frustrated isolation, she met educator Annie Sullivan, who taught Keller to communicate by spelling words into her hand. Keller eventually learned to read, write, and speak, and attended Radcliffe College. Her inspiring story made her an international celebrity, and she became a prominent spokeswoman for disability rights. After doctors advised him to give up smoking, Albert Einstein continued to chew on this briar pipe out of habit and, perhaps, for inspiration. Einstein, the Nobel Prize–winning physicist and creator of the theory of relativity, radically revised our concepts of space, time, and matter. After living and teaching in several countries, the German-born Einstein became a U.S. citizen in 1940. Ironically, through his famous energy-mass equation, E=mc2, the outspoken pacifist laid the foundation for the development of the atomic bomb. A French admirer presented this gold-capped walking stick to Benjamin Franklin while he was serving as ambassador to France. 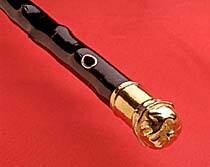 Franklin later bequeathed the cane to his friend and fellow revolutionary George Washington. A celebrated writer, inventor, scientist, and advocate for U.S. independence, Franklin rose from humble beginnings to become one of the most famous Americans of the 18th century. Through advice and example, Franklin helped define the American ideal of self-improvement through virtue and hard work. 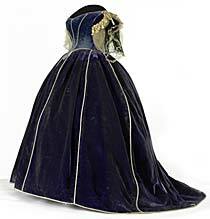 Worn by first lady Mary Todd Lincoln, this purple velvet gown trimmed with white satin and French lace is believed to have been made by Elizabeth Keckley, a former slave who became Lincoln’s dressmaker and confidante. As first lady, Mary Lincoln had difficulty fitting into Washington society. Despite being well-educated, the Kentucky native was belittled for her “frontier” roots. By demonstrating her good taste and skills as a hostess, she hoped to prove her sophistication and advance her husband’s political standing. Yet her extravagant spending on clothes, furnishings, and receptions only drew more criticism. Devastated by her husband’s assassination in 1865, she struggled with depression and failing health for the rest of her life. Born into slavery, Elizabeth Keckley used her dressmaking skills to buy her freedom in 1855. She became a prominent figure in Washington’s black community, organizing relief and educational programs for emancipated slaves. In 1868 she published her memoir, Behind the Scenes; or, Thirty Years a Slave, and Four Years in the White House. Mary Lincoln felt betrayed by Keckley’s disclosure of private details about the Lincoln family, and the two friends never saw each other again.